It’s all about the money! Or is it? In my last two blogs I went into the details of why a company would decide to outsource and some of the factors to take into account. It is really important that you understand the advantages and disadvantages of outsourcing (and there are both) before embarking on a program to bring in other companies to help run parts of your business. In this final blog on the subject, I cover off financial factors. Obviously, cost is the big one but it isn’t the only one. I will also cover some areas you need to take into account to avoid some of the more common pitfalls in outsourcing. The biggest financial factor in outsourcing is usually cost reduction. However, it can be helpful to understand where the cost reduction is coming from. Just doing something cheaper usually means lower quality, so understanding *how* the supplier can deliver a service cheaper is important. Outsourcing suppliers can often achieve cost savings through economies of scale. Larger purchasing power usually results in a lower unit cost, so a hosting supplier can probably get better prices for servers than a client with a smaller requirement. You can also generate cost savings from higher utilisation coming from a larger scale. For example, a company may need a specialised piece of kit but may only need 25% of its capacity. An outsourcer can spread the cost over a number of clients. Outsourcers can also sometimes achieve better financing deals due to volume. This benefit can be passed on to the client. They can also spread overhead across clients again lowering the unit cost. There is an economy of scale in being able to afford experts and spread their cost across a number of clients. A good example of this would be a translation service where a client may not need a full-time Russian speaker but can use an expert through an outsource service that spreads the cost across a number of clients. A popular way of reducing costs through outsourcing, and one that is high in the public’s minds, is labour arbitrage. Supplying the service from a lower cost country such as India. Wage rate or labour arbitrage drove a huge amount of outsourcing, especially in labour-intensive functions such as call centres. It isn’t always popular, but the cost savings are significant. What are the other financial benefits are there other than cost reduction? A large specialised outsourcer can convert your fixed costs into variable costs. This helps link your costs to activity levels which often reflect revenue. Dips in activity are then not so serious in their impact on the bottom line and cash flow as some of your costs can fall proportionately. An example of this is cloud hosting. Instead of the fixed costs of buying and maintaining your own servers, large cloud providers can offer a pay as you go costing model. You only pay for what you use. Cloud hosting helps cash flow, but it can also boost the company’s balance sheet. If the client is not paying the capital cost, any equipment needed could be off-balance sheet reducing fixed assets and the need to depreciate. For example, you can lease equipment instead of buying it to keep the capital cost off balance sheet. Accounting standards obviously have to be met. Risk sharing can have a financial benefit. In an in-house operation, the client usually carries all the risk. In an outsourced operation, the supplier can take some of that risk away. I caution trying to put too much of the risk onto the supplier as they should only be taking on risks they can control. Trying to put too much risk onto the supplier just bumps up the cost. Outsourcing can also increase the level of cost transparency. Internal costings normally get muddled up with overhead allocation. An invoice from a supplier, although certainly not the whole picture, gives a greater level of transparency. As you can see cost savings are a major factor in outsourcing but they aren’t the only financial factor. Why do things go wrong and what can we do to avoid problems? Finally, I would like to briefly go over some of the pitfalls I have come across and how to avoid them. Outsourcing does fail. However, my experience is that when it does fail it is usually (sorry about this) the client’s fault. In the same way as an employee messing up, you have to look at things objectively and admit that you hired them and you managed them. The employee/outsourcer may fail because they don’t have the skills… but you picked them! As with employees, outsourcing success depends very much on picking the right person and managing them well. You also need to understand what your own expectations are of what you want them to do and make sure their understanding is the same as yours. 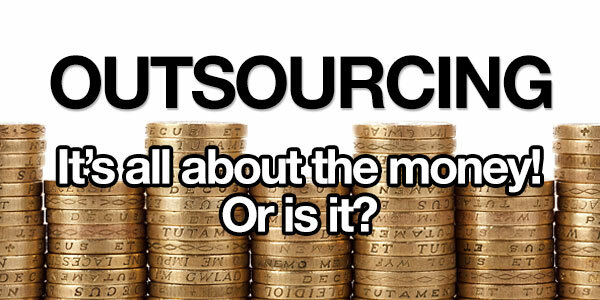 Make sure you understand what is being outsourced. There is very little chance of the supplier getting it right if you don’t know what you want them to do. Avoid being too proscriptive and aim for output based contracts. You want the supplier to deliver you an output so you shouldn’t be telling them how to do it. The more you tell them how to do it, the less able they are to use their own expertise and the more you will be responsible if it doesn’t work. It will likely cost more and not work as well. Get as much transparency in pricing as you can. If you need to change the service (and at some point you will) it will be much easier to do that if you understand the underlying costs.It is easier to get transparency at the tender stage than to ask for it once the agreement is signed. Be realistic about risk. My default is if the supplier can control it the risk is theirs. If you can control it the risk is yours and if no one can control it the risk is yours. After all it is your service regardless of who delivers it. Make sure you are geared up to manage the supplier. Like a member of staff, you can’t just leave them and hope it will be alright no matter how competent they are. Not everything can or should be outsourced. Finally never forget it is *your* responsibility. The customer doesn’t care why you failed or if it was the fault of a supplier. They look at it as your failure. Previous Post Unable to unlock FileVault due to Authentication Server refusal!